In our last three issues we’ve explored some of the scientific expectations regarding what the removal of the four PacifiCorp Klamath River dams would produce. In this issue we’re going to look at some of the political and legal activity swirling about the debate, as well as other salmon-related tidbits. Generally speaking, water users downstream of the four dams are in favor of removal. Their primary arguments tend to revolve around warm water conditions in the two largest lakes adversely affecting downstream fish populations by (1) limiting access to upriver spawning areas and (2) promoting the growth of disease-causing organisms which kill salmon downstream of the dams. 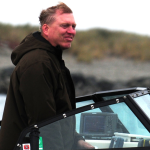 Tribal, sport and commercial fishing interests are all in favor of the projected increase in fish following dam removal, and the expectation that this will result in increased food, sport and job opportunities. 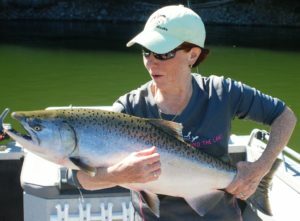 The Klamath is California’s second-largest salmon producing river system, and the prospects of nearly doubling its salmon output are alluring. In addition, there is no disputing that the river conditions below Iron Gate Dam are a problem for the fish. Upstream residents are split on the issue, generally based on where their personal water supply originates – from the stored water or from an alternate source. Those who get their water from the reservoirs argue that the dams provide (1) important stops for migratory waterfowl, (2) water reserves for drought years, (3) government-promised water rights for important food crops, (4) protection for the lower river by stopping toxic sediments trapped behind the dams, (5) flood control for the lower river, and (6) recreation-based income for a remote California county (Siskiyou) with limited industry. With the failure of Congress to act in 2015, both sides are attempting to resolve the issue without Congress, though PacifiCorp still needs approval from the government’s Federal Energy Regulatory Commission (FERC). Given that the waters downstream from Iron Gate clearly do act as a repository for fish killing disease organisms, the Hoopa tribe has filed a lawsuit regarding the water release rules in effect. As this is going to press, the Karuk and Yurok tribes have announced their similar intent, claiming the government approved water release schedule is causing very high disease rates among Coho salmon, which are listed as endangered by the US Endangered Species Act (ESA). 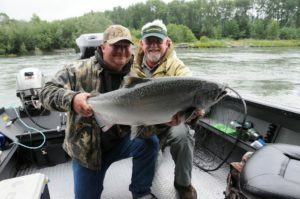 The non-profit law organization Earthjustice represents various sport and commercial fishing interests, and claims juvenile salmon infection rates were near 90 percent in 2015. Tribal fish sampling in 2014 showed a similar infection rate. As near as I can determine, the government is supposed to ensure the infection rate does not exceed 49 percent. In response to our recent drought conditions, instead of changing the water release schedule to keep infection rates below 50%, the Feds decided to draft new rules allowing higher infection rates during drought conditions. The bottom line rationale appears to be something along the lines of “even without the dams there would be higher infection rates in low water years, so it’s OK to just change the rules.” Since infected juveniles have a high mortality rate, this line of reasoning isn’t going down well with everyone! While the formation of a non-profit organization to manage the decommissioning is put together, upstream users are also headed to court. It appears that a New York based attorney has been hired by Siskiyou County to prevent dam decommissioning by attacking the process used to arrive at the deconstruction decision. To review the five options which were under discussion, review our article in the Winter 2016 issue, The Klamath River, Past and Future, pt 2. There are claims of “secret meetings” and lack of transparency in the process, with the goal of forcing removal of the dams as the only viable option. “Maintain the dams” advocates argue removal of the dams would be bad for Coho salmon and also invoke the ESA in their arguments. As is common in such contests, sometimes actual facts are lost and rumors and misinformation can take on lives of their own. In reviewing various articles and letters to the editor which are available on-line, I’ve come across such gems as: (1) “It’s all about the fish, the people don’t matter”; (2) “The endangered Coho salmon isn’t native to the Klamath watershed, so its ESA listing is unconstitutional”; (3) “Dam removal will kill hundreds of species in the Klamath Basin by release of 20 million cubic yards of toxic sludge”; (4) “Release of … yellow perch … will decimate Salmon spawning grounds”; (5) “Dam removal would be a violation of the Constitution of the United States as Siskiyou County voters clearly stated in the 2010 election by a vote of 80 percent to retain the dams”; (6) “As for the removal of dams within the borders of Siskiyou County, you will have to prove to us, the people of Siskiyou County, proof of private ownership of these dams by Pacific Corp. We are demanding the notarized Deed of Trust proving such ownership”; and (7) “they were built within hard economic times by the Bureau of Reclamation”. As misinformed as some of those statements are, sometimes there is a grain of truth buried somewhere. As an example, let’s look at number (4) regarding yellow perch. One of our members asked me once, “What will happen to all the warm water fish in the lakes?” I was unable to find the issue addressed in the Environmental Impact Review/Statement. As a kid I was once at a 3600 acre-foot lake which had just been drained for earthquake retrofit work. You could nearly walk across the downstream water on the crappie, catfish and bass present. It’s simply not possible to keep the last of the fish from washing down river. That makes this a legitimate question — What can we expect if the dams are removed? So, I contacted PacifiCorp with the question. Either they didn’t understand or they deliberately sidestepped the question in their answer, because the response I received had nothing to do with the question I submitted. It seemed to me they had no plan on how to keep non-native species out of the lower river. Granted, they would likely die quickly, cause a two-week stink, and then be done with it. 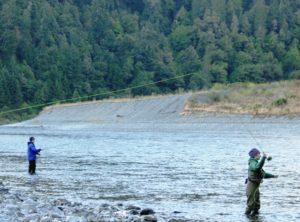 But perhaps some, like smallmouth bass, would take to a Klamath River life as they have in various other Western rivers. It might take only a few survivors. Does someone out there have a plan to prevent an influx of smallmouth bass into the Klamath? In news from up North, some recent court rulings could ultimately have local effects. In a recent federal ruling in Washington, a three-judge panel for the 9th US Circuit Court of Appeals ruled that Native American tribes not only have a right to fish for salmon, they also have a right to expect that salmon will be present. This ruling affirmed that the federal government has a duty to protect salmon habitat under various treaties dating back as much as 150 years. The case originally related to numerous culverts installed in Washington that permit water to flow under roads, but which if designed or installed poorly can prevent anadromous fish from proceeding further upriver. The ruling upheld a 2013 decision which required the state of Washington to replace hundreds of culverts with more fish-friendly intersections between waterway and road. This particular case wasn’t even the first major pro-fish decision for 2016. Shortly before this case, a federal judge ruled that a huge habitat restoration effort by the Feds was still insufficient, and that federal law might even require the removal of four huge dams on the lower Snake River in Eastern Washington. Clearly recent rulings have favored salmon and their habitat over other considerations. Since we are also part of the 9th District the rulings could have local reverberations. Closer to home, a Northern California judge recently issued a ruling which could delay Governor Brown’s Twin Tunnels project. For those who aren’t familiar with the subject, read our article from the Summer 2013 issue, Pending Golden State Water Projects. The Sacramento Bee reported that the judge invalidated the environmental management plan for the Sacramento-San Joaquin Delta, and that the plan must be set aside until deficiencies are corrected. In the last two years the estimated costs for the twin tunnels project have risen from $14 billion to something closer to $15.5 to $17 billion, even as the initially promised environmental improvement projects list has been slashed. The plan has been the target of numerous legal challenges since it was introduced by the Delta Stewardship Council. One of the major parties pushing for the tunnels project has taken a different tactic aimed at eliminating dissent. Recently the Metropolitan Water District of Southern California removed a number of potential opponents by simply buying a huge chunk of the delta. Located on or near the proposed 35-mile tunnel project, the water district purchased Webb Tract, Bouldin Island, Bacon Island and most of Holland Tract, plus a portion of Chipps Island located a bit further from the proposed tunnel route. The total land area purchased is about 20,369 acres. The water district spent the funds with the expectation that owning the property would give them more leverage during water negotiations. Ownership of the islands comes with water rights, and it may be that the water will simply be diverted to SoCal, rather than used to irrigate the farms currently on the islands. The sale closed escrow only days after California’s Supreme Court rejected a legal challenge by San Joaquin County, one of several now failed attempts to block the sale. Conservation groups fighting the tunnel likened the land buy to tactics used by Los Angeles interests to secure water rights throughout much of the Owens River Valley, east of the Sierras, in 1937. Just how to pay for the Twin Tunnels is also an interesting subject. It appears that as long as Governor Brown and allies don’t try to pay for the Bay Delta Conservation Plan (BDCP) with general obligation bonds, the matter doesn’t require a popular vote. They have no intention of risking a “no” vote, as happened to them in the 1980s concerning the peripheral canal. But then, just how do you pay? Two water agencies hoping to tap into BDCP water, the Santa Clara Valley Water District and the Zone 7 Water Agency of Alameda County appear to have been caught tapping into property tax revenue. Records released under the California Public Records Act appear to show the water agencies have been using property tax funds to pay for Twin Tunnels planning costs. The BDCP, now operating as the California Water Fix, was supposed to be funded by fees assessed on water users benefitting from the project. Opponents, such as Restore the Delta, claim that funds used to work on the Twin Tunnels project were deeply buried in the property taxes, rather than taken from water users fees. Taking property tax revenue in this manner is a violation of Proposition 13. Per Prop 13, spending property taxes for such a project requires a 2/3 general election “yes” vote. The Howard Jarvis Taxpayers Association has indicated that the offending government agencies could face lawsuits over the issue. As PacifiCorp and the many government agencies involved in the ongoing water wars announce new data or progress, we’ll try to keep everyone informed.